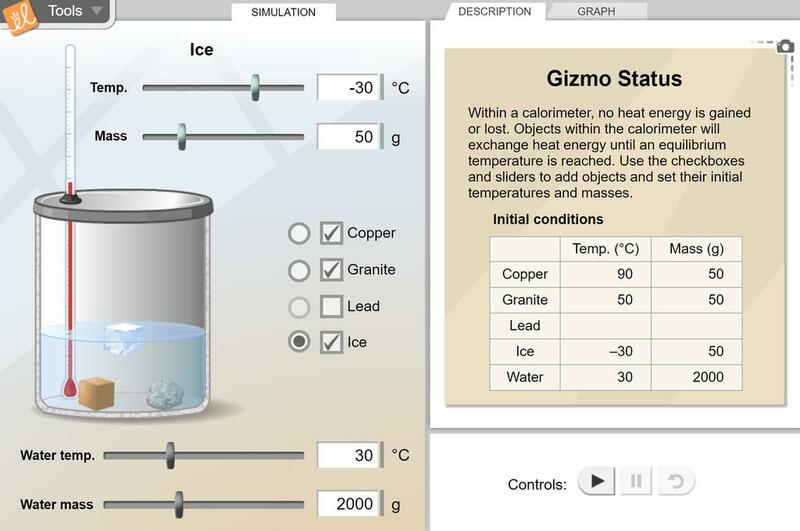 Investigate how calorimetry can be used to find relative specific heat values when different substances are mixed with water. Modify initial mass and temperature values to see effects on the system. One or any combination of the substances can be mixed with water. A dynamic graph (temperature vs. time) shows temperatures of the individual substances after mixing. Students use this data table while doing the Gizmo to organize their data. There are copies of the table... (more) per page. This gizmo complements the thermal energy section of physics 11 quite well. I love this. We can't get real data in class, and this fills the bill simply and quickly.